It's amazing what you'll find as you clean up around the house - or even around your computer. My wife and I lived in the Beaches Area of Toronto around 2004 and from time to time, I'd just grab my gear and go see what I could find. This one day in May, I decided to shoot some of the old buildings at the Distillery. 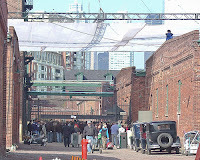 When I got there, there were antique cars, people dressed like it was 1930 - and other obvious signs of a movie shoot. It turned out they were shooting Russell Crowe's Cinderella Man. I got so interested in watching how they did what they did, that I barely took any photo's. No, I didn't knowingly see Russell, though I'm sure he's in the crowd you see milling in front of those gates. You see, this photo was taken in between "action" and is of the scene where all the men are hoping their name is called for work that day and if you've seen the movie, you know Russell's character is there many times, hoping to get just one more day's pay. Though I didn't get any pictures of other parts of Toronto that were involved in this movie, I can tell you that when you see scenes of storefronts, you are actually looking at Queen Street in Toronto, also in May of 2004. They placed 'cotton batting' along the street (near River St) and constructed 'masks' over the current store fronts, making the whole area look like 1930 again. Ironic, isn't it? The area used to look like that - then it gets many 'facelifts' through time until 2004 and then some movie crew turns back time by 60-70 years - all for two weeks of filming. It really is interesting to watch. To see photo's of the Queen Street set, visit Jason Nolan's Flickr Photostream. He shot his photo's before they 'winterized' Queen Street. 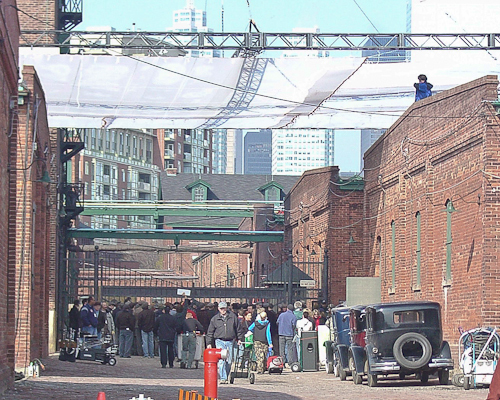 You'd be surprised just how many movies have been shot in the Distillery District. One that comes to mind immediately is Blues Brothers 2000. As the Bluesmobile rolls through a dark city street, you can see the distinctive green shutters over the Distillery windows and doors. The now closed Canary Restaurant at Front and Cherry Streets was also very clearly shown in one such scene. Anyway, enough already... It was just fun for me to go sifting through files and see this particular shot... Just thought I'd share it.